Over the past few years many EU countries have launched operational programs to implement European Digital Agenda (EAC) developed by the European Commission in 2010. According to its guidelines until 2020 every citizen of the European Union should have access to 30 Mbps Internet bandwidth and at least half of them will have access to bandwidth not slower than 100 Mbps. Poland is one of the countries in which the Agenda is being implemented. Thanks to European Union funds many local operators can compete with large telecom providers as regards high-speed broadband services. Unfortunately, applying for funding requires a great deal of work necessary to draw up proper documentation, including, among other things, development of planned FTTH (Fiber To The Home) network conceptual maps. Moreover, currently there are no GIS-based IT tools available to support the potential beneficiaries with the preparation of documentation. The complexity of the problem is even more complicated by the fact that such a software should enable a creation of documentation in accordance with specific program guidelines (e.g. the obligation to connect educational institutions). As we have extensive experience in the telecommunications industry, entities applying for EU funds asked us to create software supporting the development of FTTH network concept map. Products generated by developed software was to significantly speed up the application preparation process. Due to the high popularity, widespread availability, openness of the software and immense functional abilities, it felt natural to select QGIS as platform to serve as a basis for our solution. application of GPON network engineering rules. 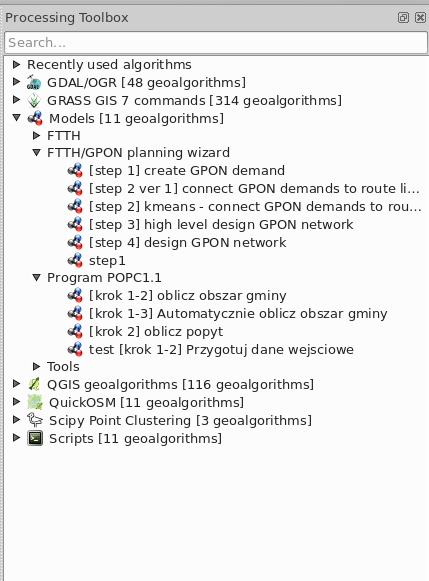 All these items were connected in QGIS platform. Below there is a brief description of how we realized the project and what functional items were incorporated to create one solution. SpatiaLite - a local database for storing input and output data. The entire solution was based on the concept of so called wizards which realize the process of preparing the FTTx network technical concept step by step. Using “geoprocessing” modeller, we created models requiring only the necessary input data from operator. Algorithmic complexity was encapsulated within models in the form of designed flow, which use existing QGIS algorithms and calls dedicated scripts. To prevent the results of subsequent analyses from getting mixed up, we provided a plugin called WorkContextTracer which groups our work in so called work contexts. Network algorithms based on the graph functions available in GRASS were enriched by adding the telecommunication scripts. We introduced a concept of demand clustering which enables to use both K-means and hierarchical methods to aggregate demand points. Geoprocessing scripts with usage of cable routing layer and Djikstra algorithm develops a cable route proposal with optical fiber nodes” locations. Operators also needed an association between created network nodes and address points to estimate the individual cost of each network branch. To complete this task, we created scripts that performs this operation storing results in local SpatiaLite database. 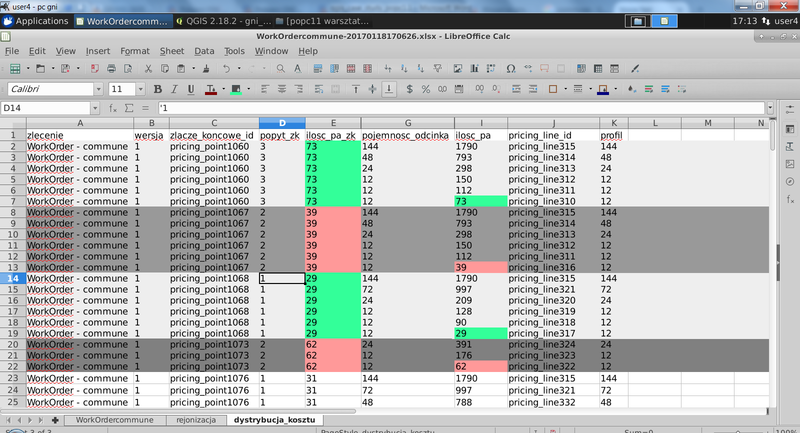 The data needed to be exportable to spreadsheet, so we used free software library to fulfil this requirement. 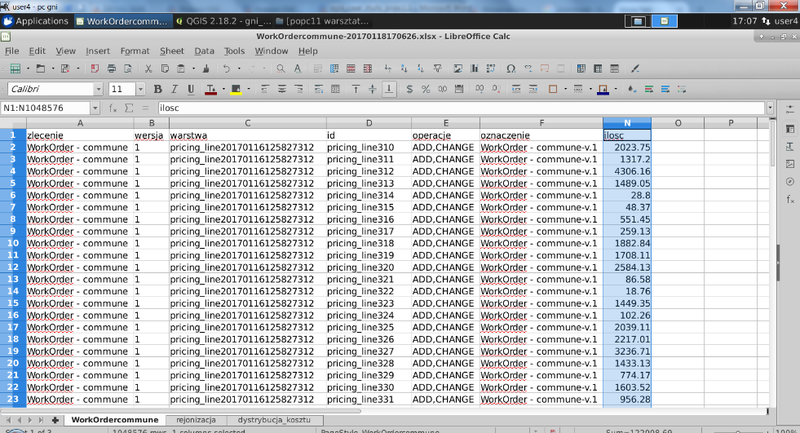 The user started work by opening a new work context and specifying an input layer of address points to be analysed. 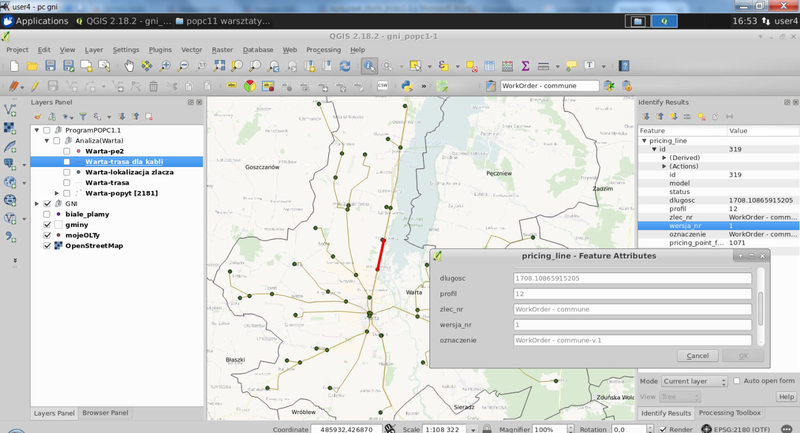 Using the standard QGIS interface, the user could establish a set of demands on address points and finally provide the parameters necessary for further steps of the algorithm. Without having information about the existing civil infrastructure, a properly filtered OpenStreet road network were used as a routing layer. Scipy algorithms fed with input parameters, clustered the address points into demand aggregates marking them with separate colour indicating its assignment to particular cluster. Having all address points clustered, user initiated the steps of high level network planning providing layers prepared in the previous steps and a layer with GPON network starting point. Upon the completion of the algorithm, in QGIS there are geometry objects representing planned cables and splice closure locations. Basing on demand data and network topology, an additional information is stored in database such as the length of the cable, its profile, node’s serving areas. At this stage, the user already had all pieces of the information to develop a high level FTTx network technical concept. The final part was generation of the data report spreadsheet showing all calculated data from several different perspectives. Thanks to the use of the QGIS platform as well as its extension capabilities, we managed to develop a free open source solution allowing telecommunication operators to prepare the documents necessary to submit application for co-financing in the EU program implementing European Digital Agenda. By combining flexible vector algorithms with the telecom engineering scripts, we enabled the practical use of mathematical algorithms in solving real problems concerning telecommunication network planning. The user operates on understandable data scope (municipality, building, road) whereas transformation of this information into a mathematical model is hidden from the user. Automatic GPON network plan development based on publicly available data and GPON technology engineering rules. Ability to customize tool with specific EU program guidelines in a given country. The big accuracy of the results corresponding to real dimensions. Generation of data needed for applying for EU funds: network concept map, cable and splice closure report with serving areas assignment. Possibility to precisely determine the construction and depreciation costs of each part of the network with calculation of the cost of connecting each address point. Possibility to prioritize address points from the most profitable to unprofitable. Possibility to evaluate basic economic indicators like ROI, NPV. https://ksavinetworkinventory.com/en/download-geospatial-network-inventory-free/ - tool download webpage. The solution is a completely free open source tool. It is part of a larger project based on QGIS and FreeCAD platforms which has intention to be used in telecommunications industry. The author of this QGIS based solution is Softelnet (https://www.softelnet.com), a company manufacturing and integrating software for the telecommunications industry for over 15 years.